The Liberty One Series basic StickPack includes Snare Sticks, Timp. Mallets, Xylo and Marimba Mallets and a Carry Bag. 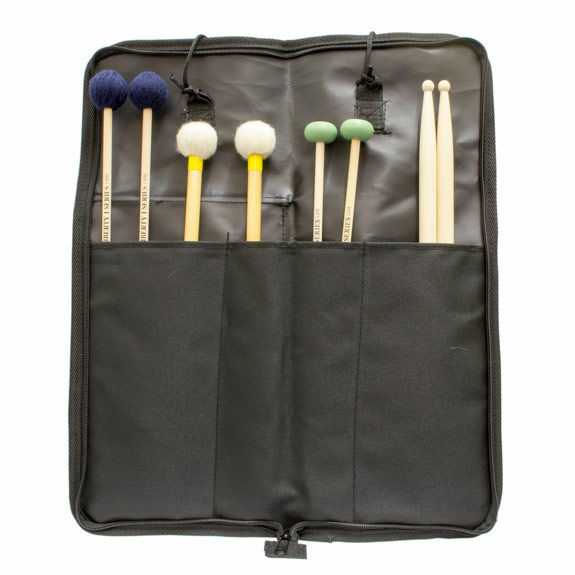 The Liberty One Basic Stick Pre-Pack is the best complete value on the market today geared specifically for the young beginning Percussionist. All Liberty One Series Mallets and Bags are made of the highest quality materials and are offered at below "name-brand" prices. Liberty One SW-02S Basic Stick Bag. Each of the products in this package are also available for individual purchase. Great experience. It was economical and it fit my budget. As soon as I ordered it it came in within 4 days or so fast than anticipated. Very happy with the whole buying experience. Literally received order the day after I placed it! Great service. The kit came very quickly. It was a little larger than expected, but it has everything my son needs for band. Thanks again. So far so good. This set arrived quickly and wonderfully packaged. It was quite a bit less expensive than purchasing separately. My son is in 7th grade band and also jazz band and is being introduced to many different percussion instruments where these mallets were needed and although he hasn't had them long, they are holding up well and the storage/carrying case is also nice. Thanks so much. The item arrived to my northern NJ location very quickly. It was well packaged and the instruments are great quality for the price.